Islander is SO not a morning person! When she and Highlander have overnight guests, she warns them not to expect anything fancy for their first meal the next day. But Highlander gets up early and makes coffee and sets the table with fruit and juice. The night before, if Islander baked a breakfast casserole (French toast), bacon-cheddar-scallion scones or sausage-cheese spirals, then he just reheats them in the oven so everyone can have a hot meal (otherwise, cold pastries or cereals will have to suffice). Sausage-cheese spirals may be one of our breakfast menu items but they also make a good afternoon snack during National Sausage Month. 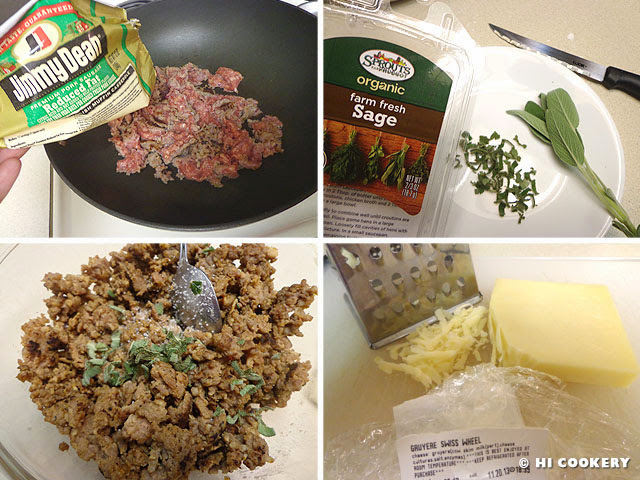 In a skillet, crumble the sausage and cook until brown. Drain off any fat and let cool. Season with chopped sage and salt. Shred the Gruyere cheese. On a clean, floured surface, unroll the French bread dough. Flatten with a rolling pin, cutting the dough and pressing the seams together if necessary, until it is a 13×8-inch rectangle. 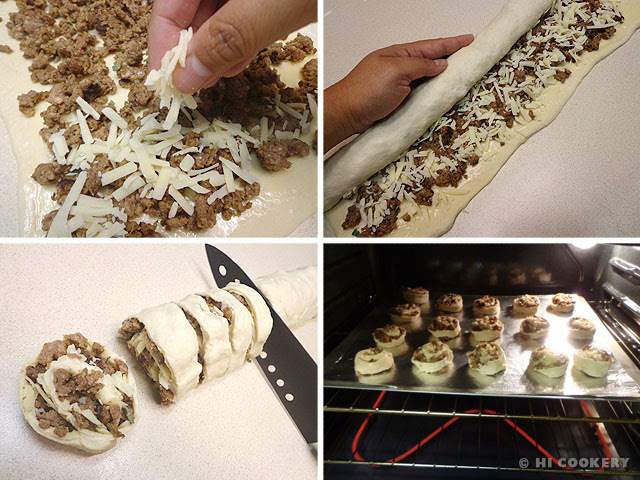 Leaving half an inch on all sides, brush the dough with melted butter and sprinkle the sausage mixture. Top with shredded Gruyere cheese. Carefully roll the long side and pinch the seams to seal well. 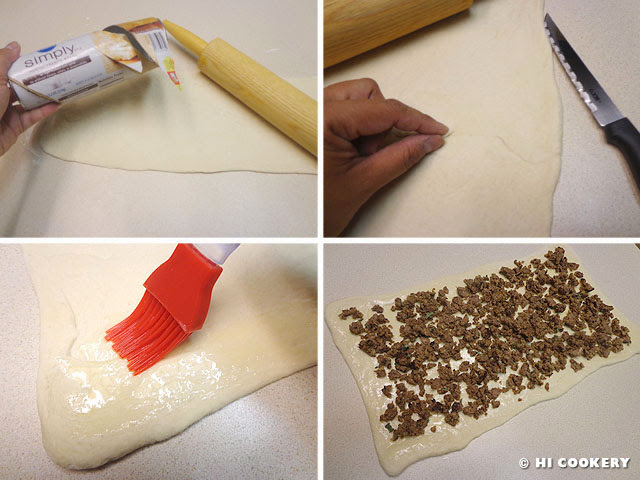 With a sharp knife, slice into spirals and discard the ends of the dough. Place onto a foil-lined baking sheet generously misted with cooking spray. Bake in a preheated oven at 350 degrees F for 25-30 minutes until brown. Remove from the oven and transfer to a serving tray. Serve hot. 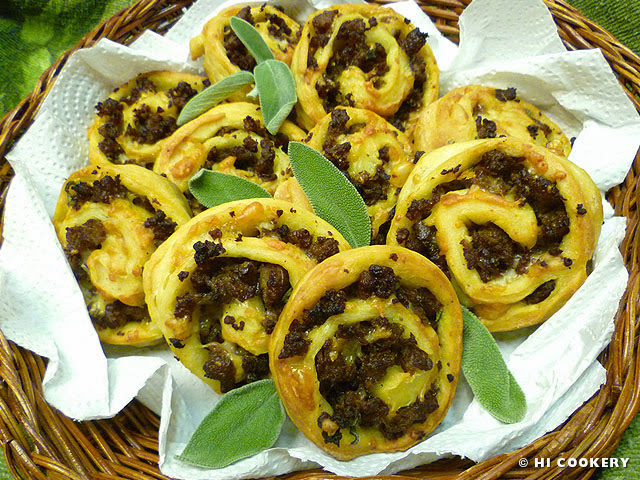 Cooking Light named this recipe “Savory Sausage Breakfast Rolls” but they look more like spirals instead of bread-buns. While this recipe was good, puff pastry would have been tastier than the French bread dough. Make these sausage-cheese spirals during National Hot Breakfast Month in February and National Breakfast Month in September.